Hatley's is Having SUPER Black Friday/Cyber Monday Deals! How many of you make it a point to shop Black Friday and Cyber Monday deals online? This is a great way to save tons of money on your holiday shopping and also stay out of the crazy Black Friday crowds. You always hear of people getting hurt in the rush to get certain items on Black Friday, but no one every gets hurt by shopping from the privacy of your own home. Happy Shopping, remember to make a note of these dates so you don't miss out. 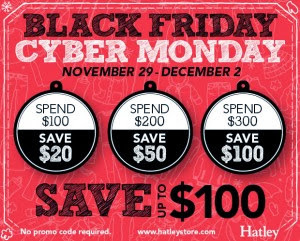 Just look at the SUPER Black Friday/Cyber Monday Deals Hatleys is having! Although primarily known for their raincoats and PJ's they have clothes for the entire family, Infants, Girls, Boys Woman and Men. This event will run from November 29 through December 2, 2013 so don't miss out on these fantastic prices on clothing that you and your family will love! Great for gift giving as well. Wouldn't it be fun to have all of your family wake up wearing these PJ's? And there is a simple red dress that is calling my name-perfect for the baby shower for my niece. You are going to love this site and I know you will find clothes and gifts at affordable prices during the Black Friday/Cyber Monday sales days at Hatley's. Sale Dates 11/29 - 12/2! !